*See your Windows Device Manager or Apple System Profiler for your drive brand and model. 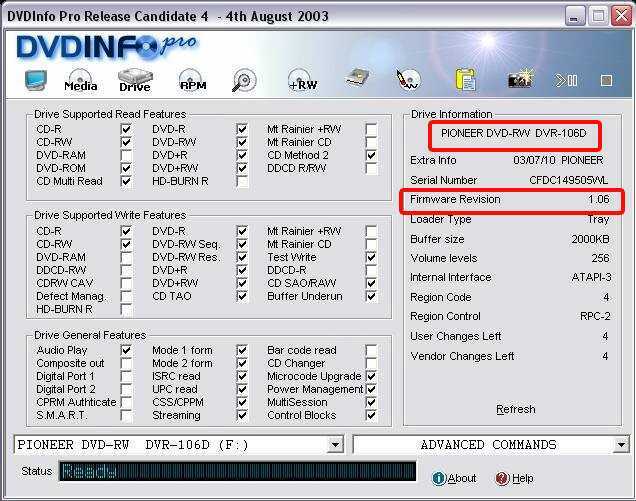 Here's a comprehensive alphabetical list of DVD burners with links to download the most recent firmware upgrades, and our best recommendations for compatible blank DVDs for each brand and model of DVD burner. This is the best and most up-to-date information we have, taken from our own tests and reports from thousands of customers. How To Use this List -- Simply scroll down to find your brand and model of DVD burner. There is a link next to each burner for the latest firmware. Check your burner to see if you have the latest firmware version, and download and install the newer version if you need it, using the download link next to your brand and model. Recommended discs -- Finally, click the links under that burner to order the most compatible, reliable discs for your machine. If your DVD burner model is not listed below -- Please send an e-mail to us for compatible media suggestions. Include your brand and model number, and firmware level if available (see how to know your firmware level below). We'll usually get back to you with specific recommendations within 48 hours. Why all this Firmware Stuff? -- DVD burners use special "write strategies" in their internal drive firmware to customize the way their laser works with each different brand of blank DVD. Each brand of DVD-R or DVD+R uses a different color of bottom dye, plastic composition and silver reflector density. This means the burner's laser must be adjusted for each different disc. From time to time, your drive's manufacturer tests more discs and develops new firmware versions to include those new disc brands and types into their drive's internal list of compatible blank DVDs. Newer firmware for your drive means it can burn more discs, more accurately, and usually faster. Once burned with this newer firmware, they will also play back with fewer errors on DVD players. For more details, read our DVD Recordable FAQ Page. FREE Windows Software to Check Your Drive's Actual Manufacturer, Model Number and Current Firmware Level - You can verify your drive's ID string or "name" using DVDInfoPro or Nero Infotool (linked below). These programs will also read out the firmware level for your drive. Both are very helpful, easy to use FREE software, offering useful features to help obtain information about your drive. They can also give you information about the media you're using. Visit a DVDInfoPro help page (provided by I/O Magic). Visit a Nero Infotool help page (provided by I/O Magic). How to Check Your Burner's Firmware Level Using Your Operating System (for Windows and Mac) -- For Windows PCs -- use the Windows Device Manager -- Right click on My Computer, then click the Hardware tab, and press the Device Manager button. Double Click to expand the listing for your DVD drive. Then, right click on your DVD burner drive and select Properties. Note your detailed drive model number and firmware revision number, if shown. For Macs -- For MacOS 9.x the Apple System Profiler is located under the Apple Menu, while in MacOS 10.x it is located in the Finder/HD/Applications/Utilities/ folder. Open the Profiler, select the DEVICES AND VOLUMES, then the ATA or IDE BUS, then expand your drive and note its manufacturer, model number and firmware level. How to Install Firmware -- Caution: Installing firmware is usually simple and generally only takes a few minutes. However, improper installation can damage your drive, so you should perform updates carefully. First understand that firmware upgrading is done at your own risk. If damaged due to a improper firmware upgrade installation, neither the manufacturer nor anyone else will repair or replace or repay you for the drive. If you're unsure about upgrading, please contact your drive manufacturer at their website support pages and seek their instructions or help. Upgades are usually permanent once performed and often cannot be undone, except in a few cases on some models. Newer firmware usually improves the drive's overall reliability and performance, making it more compatible with different brands of discs, and improving the playability of discs it successfully burns. See your manufacturer's tech support pages for firmware installation instructions, possible software conflicts and more cautions, then follow these suggestions... Basic Steps: (1) Download the firmware upgrade to your disc for your burner, linked below. (2) Remove any disc from the burner. (3) Reboot your computer, so that the memory will be as fresh as possible. (4) Quit any programs that may be running automatically, such as screen savers, virus checkers, instant messagers and so on. (5) Close any Internet connections if open. (6) Launch the upgrader program you downloaded. Follow its on-screen instructions as directed. (7) Do not turn off your computer or do any other activities during the upgrade process, until the upgrader program reports that the upgrade is complete. (8) When the upgrade is complete, you may Check your Firmware Level as described above and you should see the new upgraded level. Some Helpful Official Manufacturer Upgrade Instruction Pages -- You may want to read some manufacturers' instructions about firmware upgrading before you proceed. These are helpful general tips, even if not for your specific brand or model drive. Here are links to Firmware Upgrade Instructions from Pioneer, Iomega, Dell, and Sony. NOTE: Even though the UJ-815 drive is capable of writing and reading both DVD-RAM and DVD-RW rewritable discs, many Apple computers and software applications do not support these kinds of discs and only work with DVD-R type discs. For that reason we do not recommend either DVD-RAM or DVD-RW discs for Apple Superdrives. However, a few Superdrives do in fact support DVD-RAM and DVD-RW discs. See the unofficial firmware pages above for more information. BENQ DW1600A - Download Firmware Version B7H9 Converts drive to DW1620A, updates to Dual Layer feature for burning DL 8.5GB DVD+R feature. After application, use future updates for the DW1620A. Digital Research DVD Burners - Digital Research drives are assembled by I/O Magic Corporation. You may find the I/O Magic Firmware Page helpful, with drive photos and firmware download links for each of their drives. NOTE -- Your drive may be actually manufactured by any one of several different companies (i.e. Optorite, AccessTek, NEC, Sanyo, BTC, etc.). You will need to find out which company makes your drive, and the actual model number of their drive, before you can find a firmware. Sometimes the drive brand and model are indicated when you use the Windows Device Manager under How to Check Your Burner's Firmware Level as discussed at the top of this page, and sometimes you actually have to open the drive box and look at the label on the drive to see who makes it and the model number. Once you have that information, you can update the drive with the firmware for that model of drive, found here on this page. Note - The HP DVD300i, 300e are the internal and external models of the drive that Window's Device Manager reports as the "HP DVD300N". The "N" stands for NEC, which is the company that makes this drive for HP. These N-I-E models are actually NEC ND-1100A drives packaged under the HP logo. However, the HP model DVD300c is a different drive made by Philips and requires the different updater linked above under the 300C. I/O Magic DVD Burners - You may find the I/O Magic Firmware Page helpful, with drive photos and firmware download links for each of their drives. NOTE -- Your drive may be actually manufactured by any one of several different companies (i.e. NEC, Optorite, Sanyo, BTC, etc.). You will need to find out which company makes your drive, and the actual model number of their drive, before you can find a firmware. Sometimes the drive brand and model are indicated when you use the Windows Device Manager under How to Check Your Burner's Firmware Level as discussed at the top of this page, and sometimes you actually have to open the drive box and look at the label on the drive to see who makes it and the model number. Once you have that information, you can update the drive with the firmware for that model of drive, found here on this page.